I talked the other day on the Sizzix EU blog about how much I like to upcycle things, or how little I enjoy throwing things away. 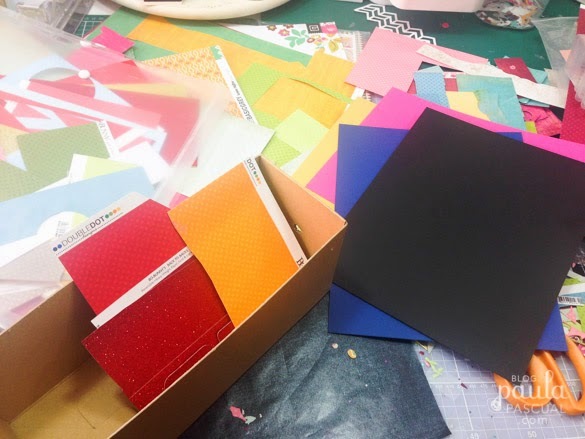 Well, today I am sharing a quick and easy upcycle to store patterned paper scraps. This one started as I had a couple of cardboard magazine holders that I had to use or space for. 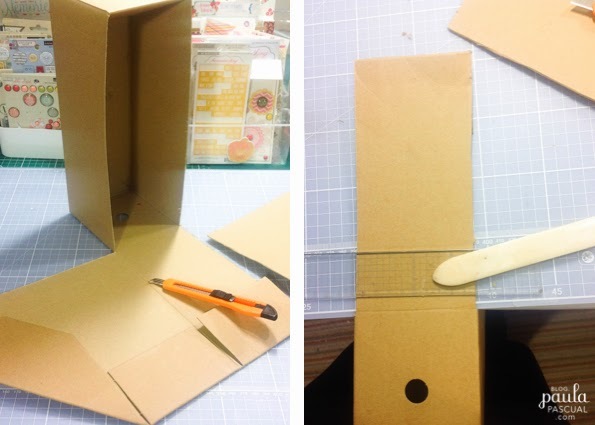 Because of that I decided to create a shape that would allow me to store something. I really didn't know what at the time. I cut the the top part to create an symmetrical rectangular shape. The excess, I did not throw away of course, kept them for another project, not sure which one. 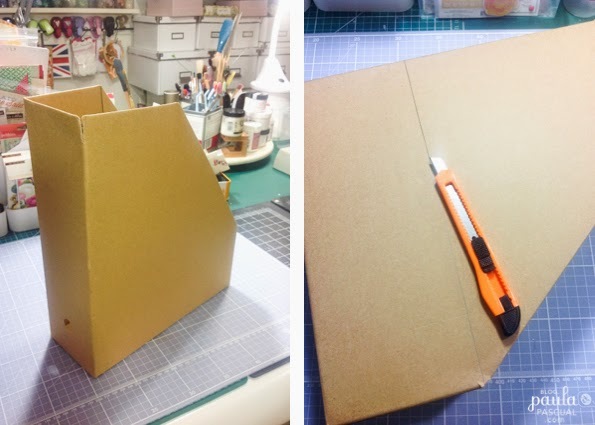 After a few weeks I thought this box would be perfect to store my scrap pieces of patterned paper for die cutting. You see, I love patterned paper that has the tiniest of patterned that is tone on tone, but as I tend to use the same colours over and over I like to keep even the smallest piece and keep it at arms length. Literally. As colour is really important for me, I classify the pattern by colour rather by pattern or manufacturer. 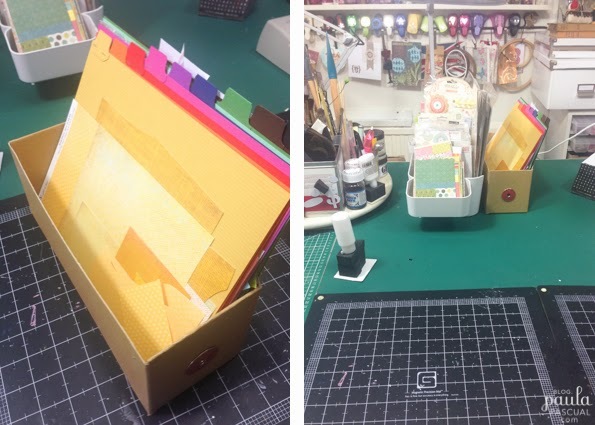 To create the colour dividers I just trimmed a few pieces of cardstock of different colours. 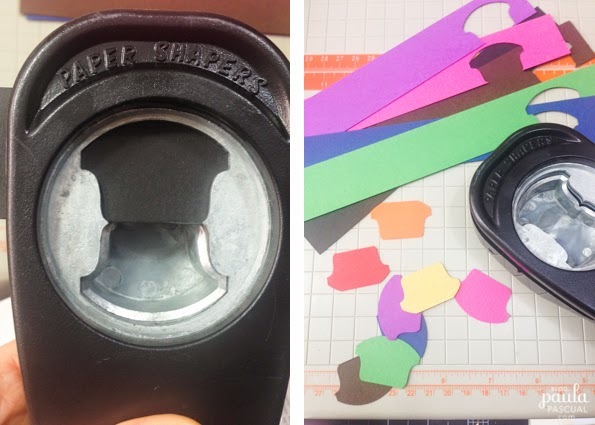 To create the tabs, I used a punch from Stampin Up, but you could use really anything. I cut out of every piece of card. Then I stapled them to each sheet so that they are really secured. The great thing about this system is that I can always add more tabs for mid colours (can you spot the turquoise) for those that I use time and time again. And on the left you can see how stays on my table. Doesn't take much space at all and it is at arms length. Simple and easy, but useful! Ypur idea is very helpfull for me because i store all spare papers but i do not clasify or store them by colors.